Livingreen Design are delighted to bring to you a collection of one off pieces that are truly unique, signed and certificated by the artist. Below are the currently available pieces, including information about the artists. We do accept commissions on pieces. Please get in touch to discuss your personal requirements or to enquire about purchasing a unique piece. 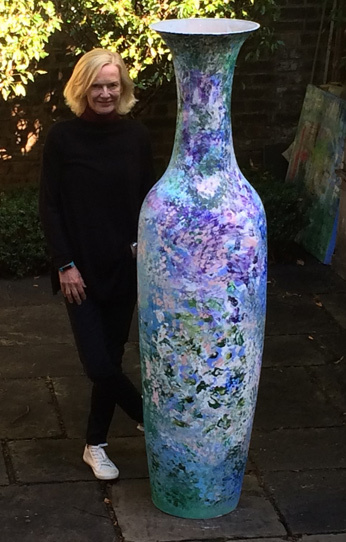 Jane Procter has broken new ground with her take on the traditional Greek Vase. 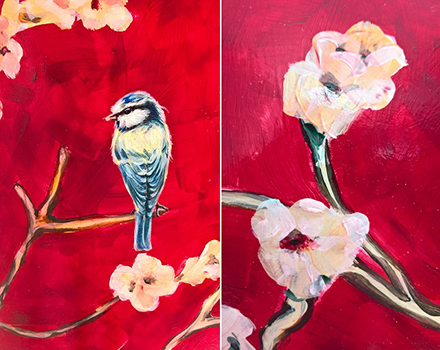 Using Vibrant UV resistant acrylic paints she has delivered a true work of art that will be equally at home in the garden or inside the home or workplace. Taking a 360 degree view one can see subtle seasonal variations on a journey round the urn - passing from bud to blossom to leafiness and back again whilst keeping to a harmonious colour palette throughout. Jane Procter is a multi-media creative whose former career spanned newspapers, magazines, internet and television. Jane was celebrated for the images she created as a fashion editor, film stylist and magazine editor-in-chief and now as an artist she is bringing her talent for visual imagery and colour to her artworks. Her love of garden design led her to innovate and create durable versions of her works for exteriors. Liz Crombie is a fine artist who trained at Gray`s School of Art. She grew up in the highlands where she could nurture her innate love of creatures and nature. Over the years she has made many arts and crafts, delivering workshops teaching others to do the same. She loves to go for a big dog walk, listen to a podcast and paint. Liz lives in the country with her partner, their children, dogs and a cat.